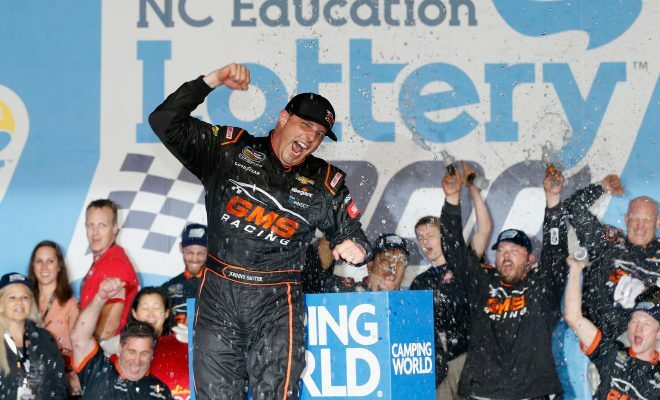 CONCORD, N.C. — Johnny Sauter wins for the third time in his 2018 NASCAR Camping World Truck Series campaign. Leading five times for 71 laps, Sauter dominated the latter parts of the NC Education Lottery 200. 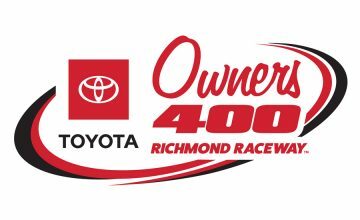 No one driver stood out when the race began; Sauter and Noah Gragson exchanged the lead four times by lap-22, when Grant Enfinger blew a tire, laying debris on the racetrack. Brett Moffitt, already a onetime winner this season, stayed out under the caution flag. 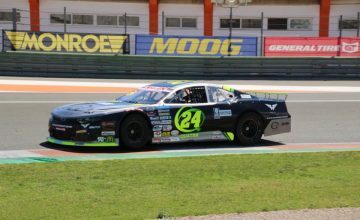 The race restarted with 4 laps left in the first stage, Moffitt was able to hold off those with fresh tires, gaining a stage win and a playoff point. The second stage went off without a hitch – no cautions and only one lead change, when John H Nemechek passed Moffitt on lap 43. Moffitt went on to win the second stage, his first stage win of the year, giving him his sixth playoff point. Moffitt and Sauter swapped the lead three times between laps 71 and 87. Moffitt started the final stage from the point, Sauter passed him and then under a caution period Moffitt went back around to the lead. On lap 87 Sauter made one more pass, taking the lead and holding it for the remaining 48 laps. Kyle Busch spent his evening hunting his 51st win, but with two penalties by his pit crew Busch spent the 134 lap race chasing the leaders. Both penalties, to Busch’s ire were repeat offenses: crewmember(s) over the wall too soon. Uncharacteristically, Busch never led a lap but even with the pit road struggles the No. 51 Cessna Toyota managed a second place finish. Brandon Jones, making a rare start for Kyle Busch Motorsports, finished behind his boss in third. Since switching to Joe Gibbs Racing in the NASCAR Xfinity Series, Jones has found more success than in previous seasons of his career, sparking a more up beat tone from the young driver. Another KBM driver, Gragson was tracking towards a top-five finish, if not a win, before a restart kerfuffle with his boss sent him deep in the running order. All evening the inside lane struggled to keep pace with the outside on restarts. On lap 118 Gragson restarted second with Busch slotted behind him in third. Busch, while getting pushed from behind, nudged his young teammate, sending him sliding to the far inside lane. By the time he’d driven around turn-two Gragson was outside of the top-ten, but with the help of one more caution Gragson managed to race up to eighth by the time the checkered flag flew. After two weeks of racing the NCWTS will take a short hiatus before returning to action on June 8th, for the Rattlesnake 400 from Texas Motor Speedway.